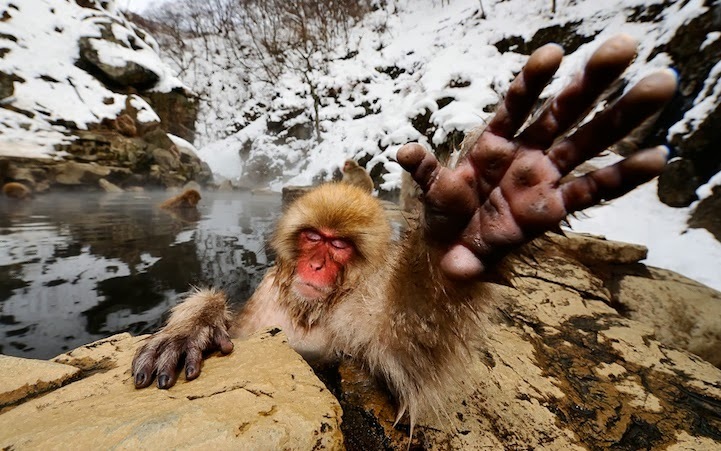 Watch Japanese Macaques as they enjoy the steaming hot spring baths and play in deep snow. 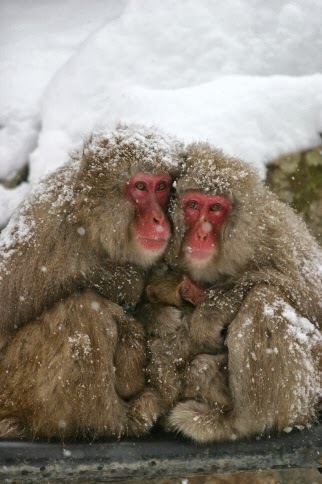 It is filmed in the Jigokudani Monkey Park (Jigokudani Yaen Kōen) near Nagano. 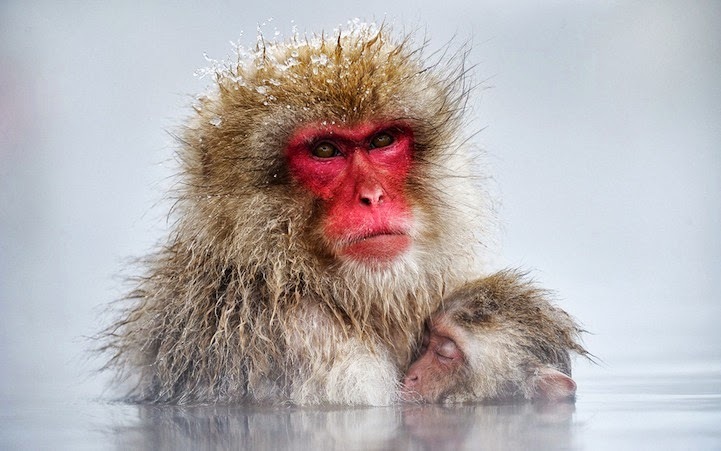 Join wildlife & nature photographer Marsel van Oosten on a Squiver Photo Trip to Japan and come back with great pictures of snowmonkeys and much more amazing Japanese wildlife! 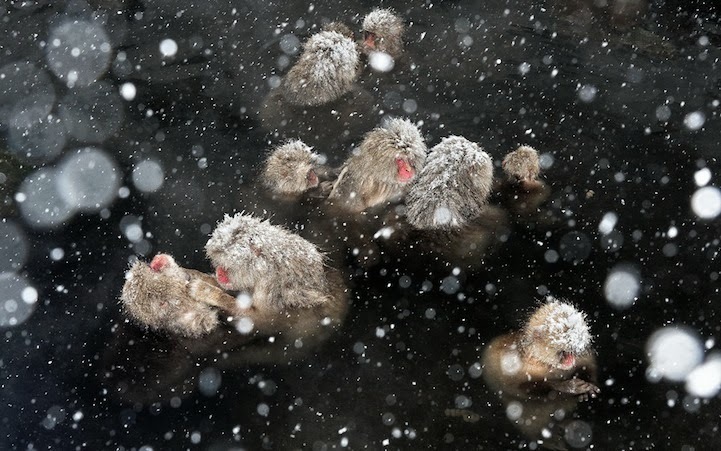 This intriguing series by photographer Jasper Doest features a glimpse into the peculiar world of wild Japanese macaque, also known as snow monkeys. At one point in their existence, in a perfect example of adaptation, these creatures developed a system for staying warm by bathing in the hot springs in the surrounding area. 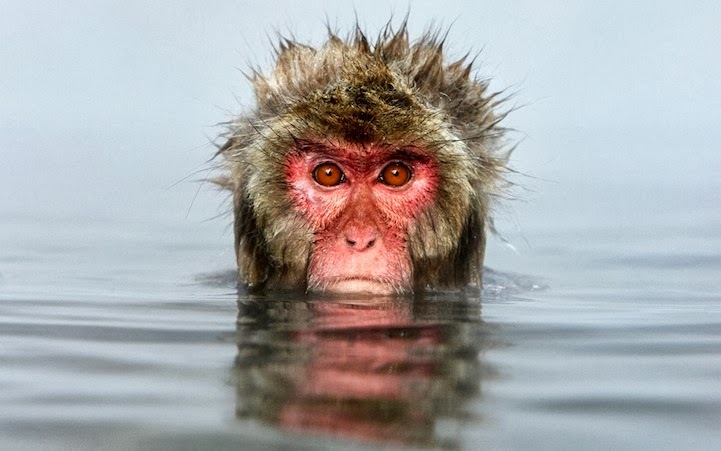 Doest explains, "Now, only some decades later, they not only bath on a daily basis, the life of these highly intelligent monkeys seem to have adapted to this aquatic environment." The bathing process has become a popular place for people to observe and photograph the wild monkeys in their unique, natural habitat. In the series, Doest documented the animals as they splashed and played, as well as when they enjoyed a quiet moment along the side of the springs. His many striking, intimate images include scenes when, for example, a small, furry head peeks out of the water and stares back, directly into the camera. The Netherlands-based photographer finds his inspiration from nature. He documents the beautiful world around us, bringing all kinds of rare experiences to his viewers. He says, "I owe a lot to the natural world and photography is my way to give something back." The Japanese macaque, is a terrestrial Old World monkey species native to Japan. 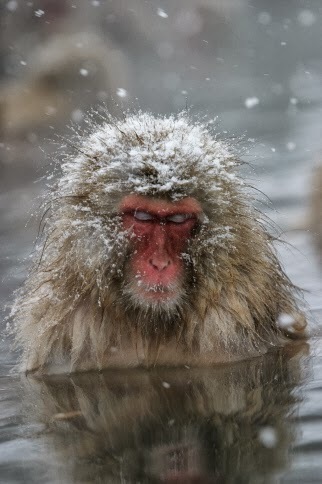 It is also sometimes known as the snow monkey because it lives in areas where snow covers the ground for months each year — no primate, with the exception of humans, is more northern-living, nor lives in a colder climate. Individuals have brown-grey fur, red faces, and short tails. There are two subspecies. In Japan, the species is known as Nihonzaru to distinguish it from other primates, but the Japanese macaque is very familiar in Japan, so when Japanese people simply say saru, they usually have in mind the Japanese macaque. 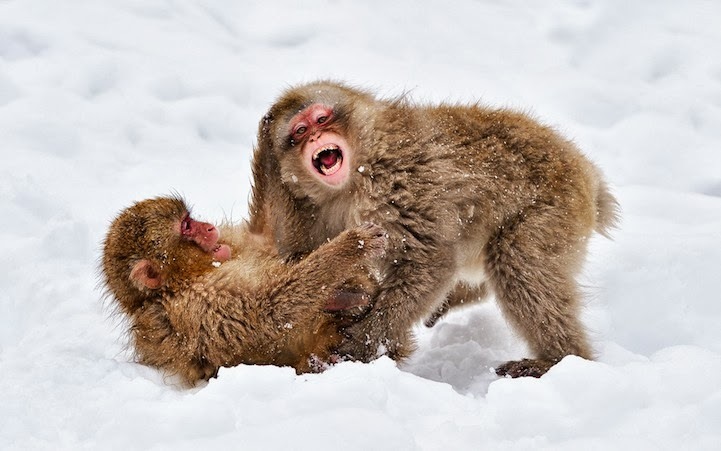 Japanese macaques live in matrilineal societies, and females stay in their natal groups for life, while males move out before they are sexually mature. Macaque groups tend to contain multiple adults of both sexes. In addition, a macaque troop contains multiple matrilines. These matrilines may exist in a dominance hierarchy with all members of a specific group ranking over members of a lower-ranking group. Temporary all-male groups also exist, composed of those that have recently left their natal groups and are about to transfer to another group However, many males spend ample time away from any group and may leave and join several groups. The Japanese macaque is a very intelligent species. Researchers studying this species at Koshima Island in Japan left sweet potatoes out on the beach for them to eat, then witnessed one female, named Imo (Japanese for yam or potato), washing the food off with river water rather than brushing it off as the others were doing, and later even dipping her clean food into salty sea water. After a while, others started to copy her behavior. This trait was then passed on from generation to generation, until eventually all except the oldest members of the troop were washing their food and even seasoning it in the sea. She was similarly the first observed balling up wheat with air pockets, throwing it into the water, and waiting for it to float back up before picking it up and eating it free from dirt. An altered misaccount of this incident is the basis for the "hundredth monkey" effect. Traditional manmade threats to macaques have been slash-and-burn agriculture, use of forest woods for construction and fuel, and hunting. These threats have declined due to social and economic changes in Japan since World War II, but other threats have emerged. The replacement of natural forest with lumber plantations is the most serious threat. As human settlement has grown, macaques have lost their fear of humans and have increased their presence in both rural and urban areas, with one macaque recorded living in central Tokyo for several months.